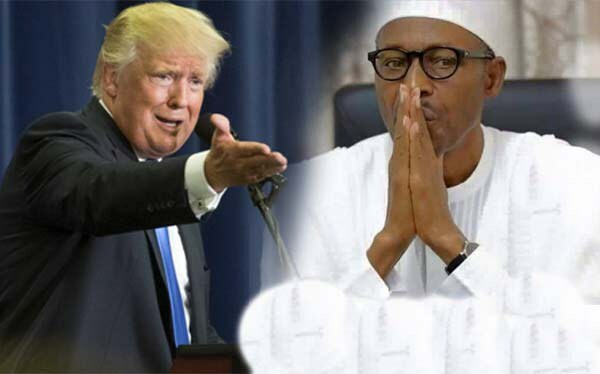 US President Donald Trump reprimanded President Muhammadu Buhari saying "to go back home and stop the killings in his country"
By now, you may have read that after his spectacularly underwhelming US visit, President Muhammadu Buhari decided to have a ‘technical stopover’ in London on his way back to Nigeria. Technical stopover! How I wish the Buhari administration can show its creativity in things that matter? It is sad that they are only creative in coming up with absurd lies like the lie that rats chased the President from his brand new office forcing him to work from home. And now, we have the latest lie-‘Technical Stopover’! Since I was born, I have never heard of ‘technical stop over’. Who is receiving technical support in London? Is it the Presidential jet or the President? The Presidency should stop embarrassing itself. If President Buhari wants to see his UK doctors, why won’t the Presidency say so, instead of this ‘technical Lie’! Is it a crime to be unwell? Why attempt to deceive the people with childish lies? After ‘technically defeating’ Boko Haram, they want us to believe Buhari has made a ‘technical stop over’ in London. What kind of government of ‘technicality’ do we have? They never do anything in actuality. It is always done in technicality. Nigerians must give them a Technical Knock Out with their PVCs in 2019. And the lies are just a pattern of behaviour from a government that was conceived in lies, birthed in falsehood, and sustained on fallacies. For instance, imagine that after all former US President Barack Obama did to help elect Muhammadu Buhari by frustrating the Jonathan administration, the Buhari government, in order to curry favour with President Trump, has publicly denounced President Obama and declared that he was not very helpful to Nigeria. This again is another pattern of behaviour of the Buhari Presidency. Once they have climbed on your back to get what they want, they dump you, especially when you are considered no longer useful to their future aspirations. Dino Melaye is learning about this the hard way. Dino helped misinform the public about the Jonathan administration through the use of propaganda and celebrated the defeat of the Jonathan government. He thought the government he helped elect would be his stepping stone to greater things. Today, what are they doing to him? They have spent monies they refused to spend on bettering the lives of Nigerians on Dino’s recall and are concurrently using the police to persecute him so much so that Dino Melaye was forced to jump out of a moving police truck. And look at the charge the police preferred against him-attempted suicide. This is what you call ‘technical stopover’ not the one Buhari did in London! Thankfully, the attempt at recalling Dino failed spectacularly. Sometimes, I wonder if it is because the Governor of Kogi is named BELLO that his plans to unseat Dino failed BELOW expectation. I always say names affect destiny. Nigerians BOO BUhari, LAI LIES, FASHOLA can't produce a FLASH of electricity, Femi AdeSINa keeps committing the SIN of lying and EL-Rufai turned Kaduna to HELL! And their pattern of lies continues, with the latest lie being from a supposed pastor. Vice President Yemi Osinbajo at this year’s edition of The Platform, alleged that three persons who served under former President Jonathan looted $3 billion from the nation’s coffers. Of course, Vice President Osinbajo could not name these three persons because they exist only in his jaundiced imagination. It is the same thing he did a month ago when he lied that former President Jonathan personally took 100 billion Naira in cash from the Central Bank of Nigeria and stashed it in his private residence in Abuja. Of course, when challenged to provide proof, the Vice President hid behind ‘sources’ and never substantiated his claim. Why? Because Osinbajo is a liar! The more President Muhammadu Buhari and Vice President Professor Yemi Osinbajo try to destroy the image of Dr. Goodluck Jonathan, the more he continues to shine against their darkness. By the time Jonathan handed over to Buhari after five years, he had initiated started and completed 1979 projects. How many projects has Buhari initiated started and completed in three years? And it is because they know that they cannot run on their record of performance that President Buhari and Vice President Osinbajo continue to make outrageous statements in order to divert the attention of the public from the fact that they have nothing to offer.